Hi, I'm Leonore - I live in southern Germany, together with my boyfriend Felix. I'm working at university in the Computer Science department, hoping to earn my PhD in a few years. We did a little stitching in elementary school (I think it was a tote bag) and I really liked it, so I asked my grandma (who always supported my in my crafty endeavors - she also taught me how to crochet when I was maybe five) to get me some supplies and my next project was a little mat in printed cross stitch. Then I got a book about counted cross stitch and started to teach myself, and since then I've been stitching on and of, but I only 'really' got into it was one of my main hobbies in 2013. I've been blogging since December 2013. 2013 was the year I first discovered that there was more to stitching than flowers and the few Vervaco kits I could sometimes buy around here - when I discovered stitching shops and groups on the internet, and people making their own patterns. I joined the Stitching Pirates (http://stitchingpirates.deviantart.com/) group on deviantArt, and my now-friends Carla (http://alaskawolfpack.blogspot.de/) and Nancy (http://thewindisfair.blogspot.de/) were just getting ready to start their '2014: The Year of the Magnificent Teresa Wentzler' SAL. I had not heard of Teresa before, but a few minutes of research later (I did look at her work a lot more than a few minutes, but that was all it took for me to fall in love!) I knew I needed to get in on that, so I started gathering supplies and started my blog. It took my quite a while to find a name I liked, actually - I remember trying a few that were taken, although I can't remember what they were - and I wanted a name that reflected more of me than just my passion for crafting. So we have all the tools of my trades - Needles (for all kinds of crafts), Pens (for Writing/Reading) and Swords (for all the things Fantasy). I'd love to have an organized rotation or even stitch OAAT, but I never stick to either of those for very long, so I guess I'd have to say I'm mostly random and also highly deadline-oriented - I tend to pick up way to many gift projects, so I'm almost always on some mad dash to get something finished on time! As with all of my hobbies, there are way too many things I like - so many awesome designers and designs out there! I love fantasy designs, but also samplers and monthly series, and for designers there are just sooo many...but if I had to pick three, I guess those would be Teresa Wentzler (although I haven't stitched many of her designs yet, but I love almost all of them, and she is the one that got me 'seriously' into stitching in the first place), Jody Ellis from Unconventional X Stitch (she does awesome, and a little unconventional, full coverage designs, and I have three of hers on the go right now) and Joan Elliott (again, I have not stitched a lot of hers, but she has so many beautiful designs that speak to me). I guess as with many stitchers, the finish I am most proud of is my first full-sized Teresa Wentzler finish: Angel of Frost. This was more towards the beginning of my stitching 'career', in 2014, and does go all out with tons of blended threads, 1over1, specialty stitches and heavy beading, and I'm really pleased with how it turned out. It was also my (or our, as I usually can count on Felix' help with stuff like this) first attempt on more elaborate framing, using matting and a stick on mat, but It's still a bit crooked so I'd really like to reframe it eventually. My worst disaster and every stitcher's nightmare happened only recently - I managed to hold my fabric vertically instead of horizontally when starting my big Fire & Ember project, and only realized after a good couple of pages that I wouldn't be able to fit the whole design on there! Thankfully, it's a full coverage design, so I was (or still am, as the fixing is not finished just yet) to cut the fabric from the bottom, re-attach it to the side, and just stitch over the seam, and it's turning out quite okay. I love trying new techniques and there are so many I'd love to attempt! To name just a few, there is blackwork, hardanger and Sashiko. I'd also like to do a lot more with beads, like 3D work and incorporating them into crochet and knitting, AND I have almost no experience with finishing other than framing, so there's a lot to try out as well! I do have a box of FNFF-pieces, both recent stuff and things from further back, when I didn't really care about anything but the actually stitching. For many of my newer projects, I do have a plan, but not yet the skills (or, not enough confidence in my skills) to actually finish them. So far, I've only done framing, but there are only so many walls you can put stuff on! And the other on is Ink Circles 'Turtles all the Way Down' stitched with Jodyri's 'Feathered Friends' pack - I used a different 'direction' of stitching on each one of those turtles! I really wanted my secret to be that I LOVE bad jokes, but of course, when I really want to think of one, I can't...so I'll confess something different: After just three years of serious stitching and stashing (one and a half of that on the Stitch from Stash budget as well!) I might have already accumulated more patterns and kits than I can ever handle...but shhh, don't tell Felix...he can keep believing I'll always need some more stash! I'd like to thank our lovely host Jo for both this Blogger of the Week projects and all the other Blog Hops and events she's organizing. 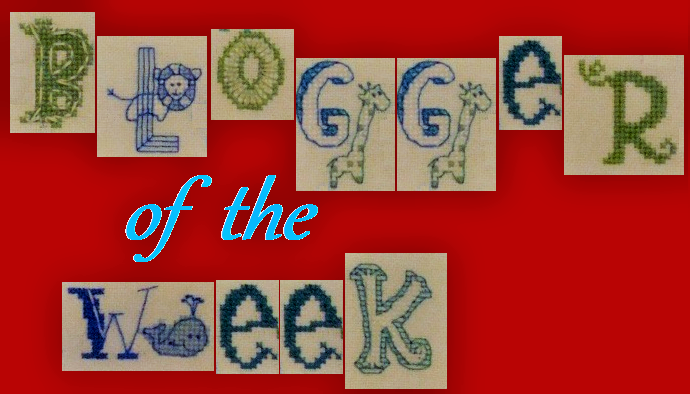 Blogging is fun, but it would not be half as fun without that huge network of stitchers and crafters all over the world, and I believe without her, I'd be a lot less well connected and miss out on so much fun! Hello friend nice to meet you. Wasn't it wonderful when you discovered the whole world of stitching shops and designers' websites on the internet? Angel of Frost is just awesome and I admire every stitcher who is able to finish one of these elaborate Teresa Wentzler pieces. It was *so* wonderful! So many more choices than in just the buttinette catalogue, haha. And so much more than I will ever be able to stitch too! Thank you for your kind comment. 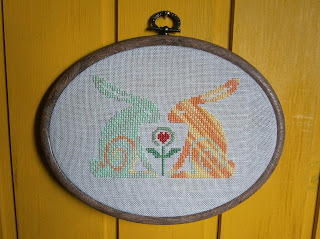 Lovely to read about you Leonore.I love your Turtles All The Way Down and your Spring Bunnies. I like how your blog name originated. Leonore, lovely to meet you. Your 'Angel of Frost' finish is very impressive. Hi Leonore! It's a pleasure to meet you and get to know so much about you. I'm from the US but lived in Germany for a while, your country is so beautiful. Your stitching is just lovely! I love the "Angel of Frost" but "Turtles all the way down" is such a cute stitch! I've done a few Teresa Wrentzler patterns myself and love her work too! Hi DJ, nice to meet you as well and I'm happy to hear you liked my country as well. I think the turtles were one of the most fun things I ever stitched! These designs are lovely!Nice to meet you!AriadnefromGreece! Thank you, nice to meet you as well! Thank you so much for sharing all about you and your stitching. Thank you. I much enjoyed doing the interview! Love reading about you Leonore. Great answers. Thanks for posting Jo!! Love reading these. Lovely to learn more about you Leonore. I think it's fascinating to learn how others became stitchers. One of my first finishes was a Teresa Wentzler design, I love yours. Thank you so much! I'm always impressed when people stitch something that complicated early on in their stitching 'career'. Leonore, I so loved reading more about you and your stitching journey. Fascinating. Fire and Ember - eek! Although it looks like you have been intrepid and solved the problem - well donw. Great post. Thank you! The misorientation problem on Fire and Ember really was a scary experience, but I think I have become more capable for solving it. P.S. Angel of Frost is stunning! So nice to learn more about you! I can't wait to see more of your Fire and Ember! Very pleased to meet you! 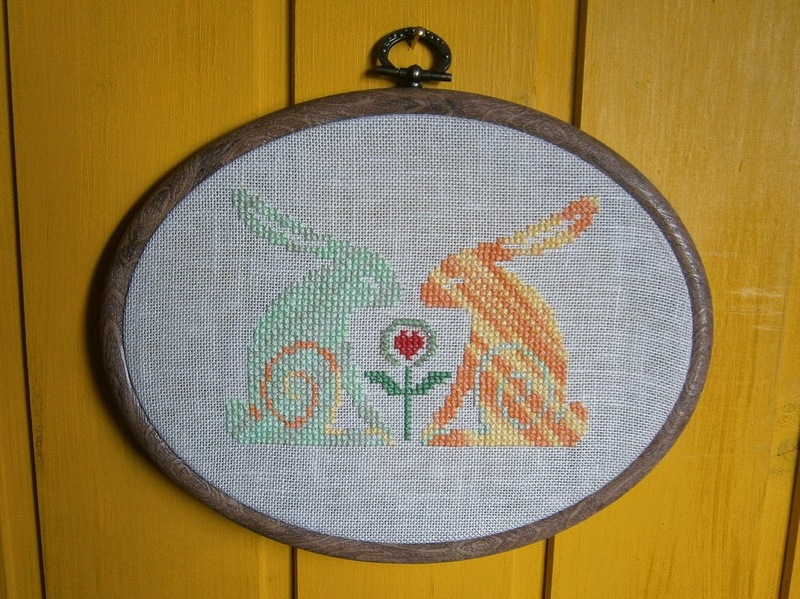 Beautiful stitching, Leonore! Your Angel of Frost is exquisite!! I especially love your turtles and need to dig it out of my stash pile! You are very brave to fix your stitching disaster that way, I hope it works out for you. Thank you a lot :) I hope your turtles will turn out lovely. I enjoyed learning more about you Leonore. Lovely stitching.